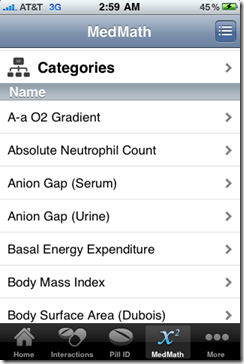 Epocrates Essentials App Review for the iPhone – Does the legendary medical app live up to the hype? The first app I downloaded on my iPhone was Epocrates. I didn’t think twice about it, and in a way I assumed it was my obligation to do so before I saw patients in the hospital. Such high regard for this medical app elicits thoughts of a deep history, but it really burst onto the scene in the late 90s on the classic palm PDA platform. Epocrates quickly gained market share because it offered key functions for free, unlike its competitors. This tactic of offering some functionality for free has not changed over the years. 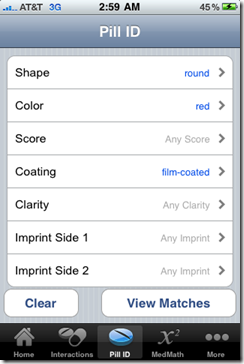 Unlike its arrival to the Palm PDA platform, Epocrates is considered the first medical application for the iPhone and iPod Touch platforms. 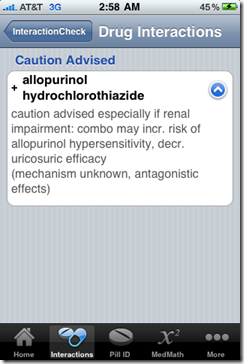 The free version of the application is one of the most heavily downloaded medical apps in the App Store. There are four different versions of Epocrates you can have on your iPhone or iPod Touch. Each version offers different features and subscription fees. The default application in the App Store is free, but in order to get the premium versions you can upgrade either online or through the app. In this article, I’ll review Epocrates – Essentials, the second premium level offered, and also go through the key features offered in each level of subscription. 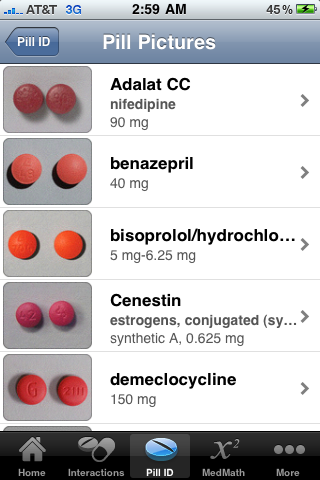 This is the largest medical app we’ve reviewed to date, content wise – so there will be lots of pictures! When the application is opened to the home page you’re presented with quick hitting health care facts, summarized literature, or suggestions on how to optimize your Epocrates experience. 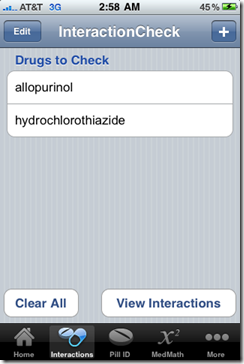 From here you’re given the option to select the tabs on the bottom, “interactions”, “Pill ID”, “MedMath”, and “More”. The application is definitely quick, and the user interface is extremely clean and easy to use. Drug Interactions – This features is one of the most popular offered by Epocrates and is a crucial tool used by health care providers at the point of care. Very useful with geriatric patients who can be on multiple drug cocktails at one time. 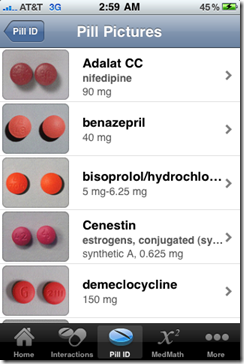 Pill Identifier – Pill pictures: One of the coolest features offered by Epocrates. This feature was getting huge amounts of hype when the first iPhone 2G was released. My own peers in the medical field were contemplating getting an iPhone for this innovative feature alone – they didn’t – but that’s the type of excitement it generated. 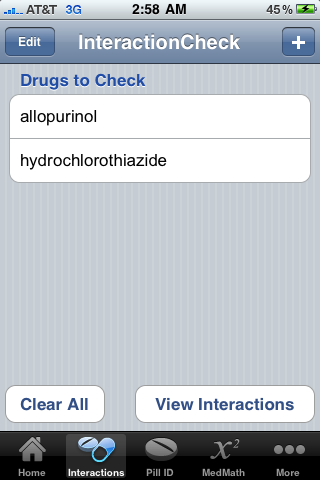 Drug Info – Information on thousands of drugs. This includes mechanism of action, pharmacology, drug pricing, ability to add custom notes, and all the other basic drug info you could possibly want. MedMath – When the free version of Epocrates first rolled out this feature was lacking in functionality. 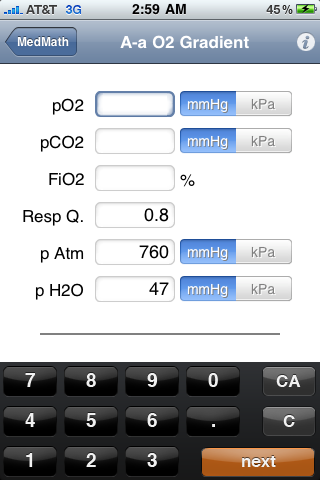 We’ve reviewed other medical calculators, and although this portion of the app does not contain the same volume of equations as other calculators, the equations it does have are more than satisfactory. 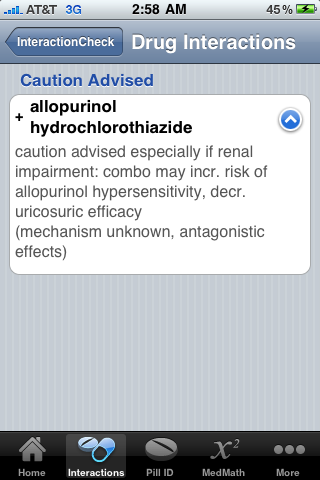 Some key equations I’ve found useful are the dosing calculator, Osmolarity, and the Parkland Burn formula. There’s even a formula for number needed to treat! 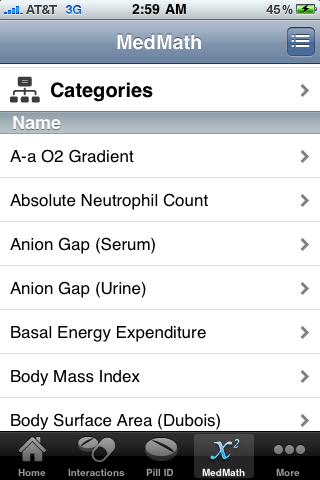 11 Responses to Epocrates Essentials App Review for the iPhone – Does the legendary medical app live up to the hype? Tom, that level of customization is definitely a plus, and as you can see from the screen shot I included, there are a lot of formularies, broken down by your location, that you can select. For me, the wal-mart list is the most useful. is this available on I pad? No version of Epocrates is free. It is bought and paid for by big pharma. Even in the paid versions, pharma companies bid to show up at the top of the meds list. Google ‘unbiased medical apps’ for better options.